I think the focus on all alternative forms of energy is necessary. Based on the price of gasoline and oil, it is essential to explore all plausible options. Another option to foreign oil is offshore drilling. Recently, the house approved a partial lifting of the drilling ban. This allows oil companies to drill offshore, yet many argue that unless the ban is lifted to allow drilling to occur inside the fifty mile mark, little progress will be made. Federal studies have shown that 85% of oil reserves are within this scope. http://primebuzz.kcstar.com/?q=node/14439. Offshore drilling continues to be a huge focus of the economy, especially in the election. Exploring options and being innovative in our approach to lowering our dependence on foreign oil is critical and will shape how the United States progresses as a nation over the next decade. 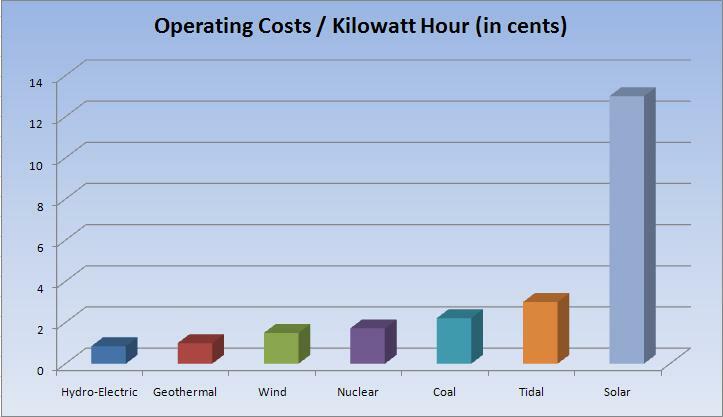 James, this is a well-written, straightforward comparison of alternative energy sources. Nice work. I agree with your conclusion – of the alternatives you compared, nuclear energy is the most promising candidate to consistently satiate an appreciable portion of energy demand. It’s ‘environmentally friendly,’ efficient, and, at least at this point, large supplies are available at reasonable prices. In order to feasibly implement nuclear power on a wide scale, I think two main obstacles will have to be overcome: (1) public opinion; and (2) waste management issues. Regarding public opinion, events like Chernobyl and 3-Mile Island coupled with the whole Cold War mentality have really worked against America forming a collectively positive opinion on nuclear energy. 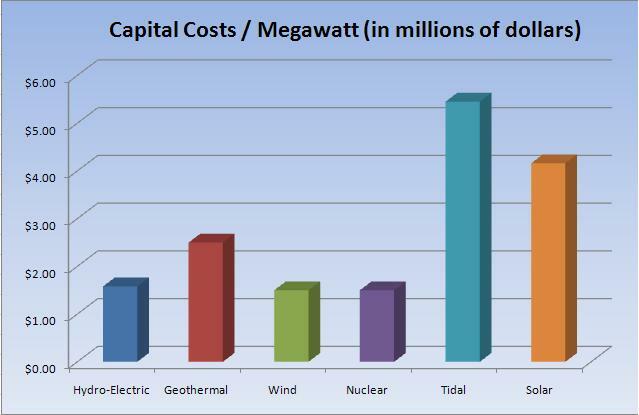 However, with rising energy costs and an emphasis on reduced emissions, I think nuclear energy, the most commercially viable alternative energy source at this point, will become increasingly more popular in the short and intermediate term. In the long term (50+ years), uranium, itself a limited, non-renewable resource, could cause a replay of the current oil situation. However, implementing nuclear power plants now would provide extra time for commercialization of other alternatives and/or creation and implementation of new alternatives. Nuclear energy is a very viable and, as you pointed out, an economic ‘bridge technology’ for weaning the world from its fossil fuel dependence. In terms of waste management, you make an excellent point that methods of efficiently handling nuclear waste have improved. However, further improvement would not only help the logistics of operating nuclear facilities, but would also contribute to encouraging the public to accept nuclear power on a wide, commercial scale. J.D. is correct to focus on uranium fueled power plants as a key to solving an energy policy dilemma: how to reduce fossil fuel use on the one hand and still maintain a reliable supply of reasonably priced electricity on the other. Sadly, I believe Collins is correct re the likely resistance of the American public to a new generation of nuclear power reactors. Here are ten points I believe must be satisfied for any US energy policy to succeed. 2. Renewable sources of electricity will not eliminate the need for new coal or uranium fueled plants. 5. Any CO2 reduction policy, to be successful, must address all major sources of greenhouse gas emissions, not just fossil fueled power plants. Just a little fuel to add to this smoldering fire. According to Matt Simmons, we have already passed that peak. And while we’re not going to run out of it anytime soon, the era of easy oil is over, and the world is about to enter a period of convulsive change. Id. Simmons was transformed overnight from an influential industry expert to an A-list pundit by the publication in 2005 of his book “Twilight in the Desert: The Coming Saudi Oil Shock and the World Economy,” a fairly technical read which argues that Saudi Arabia’s oil supplies are much more limited than everyone thinks. Does this need an update in light of the sharp, Saudi-Arabian caused drop in oil prices? This is a great initiative all countries around the world should start to follow. Mother earth gives us so many options for energy source and people should start utilizing them without abusing her. Clean renewable energy should be taken advantage to rather than exploiting the natural resources while harming the nature in return. Some Thoughts on “The Big Socialist Bailout” When Will the U.S. Housing Market Reach Bottom?